© Dave Sanders for The New York Times Vice President Mike Pence last week at the United Nations General Assembly in New York. Vice President Mike Pence will signal a far tougher American line on China on Thursday, delivering a speech in which he is expected to accuse the Chinese of aggressive moves against American warships, of predatory behavior against their neighbors, and of a sophisticated influence campaign to tilt the midterms and 2020 elections against President Trump. 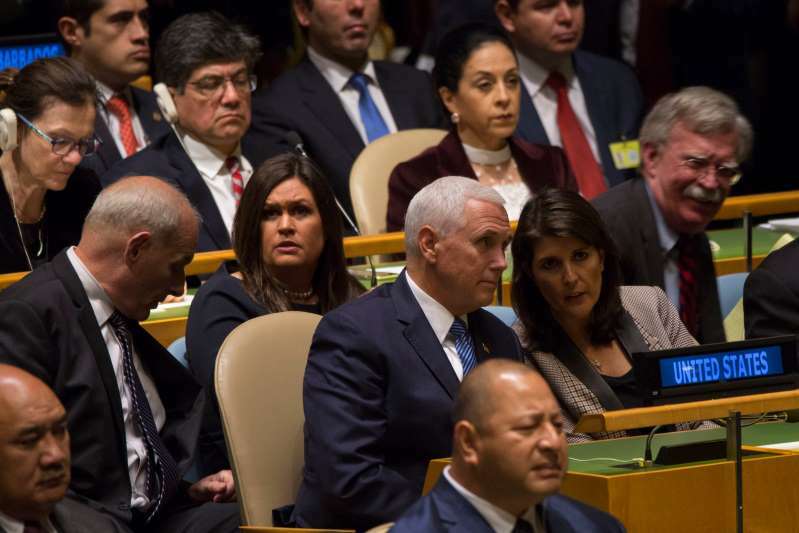 Mr. Trump accused China last week of meddling in the midterm elections, saying at the United Nations in New York that it was retaliating for his imposition of tariffs on $250 billion worth of Chinese goods. But the president was careful not to antagonize China’s president, Xi Jinping, with whom he has cultivated a personal relationship. Mr. Pence, however, will broaden the attack on China to encompass its rapid military buildup in its coastal waters; its use of debt financing to corrupt financially vulnerable countries; and its influence campaign in American news media, at think tanks and on college campuses, which he will claim is more extensive than that deployed by the Russians in 2016. As ties between Washington and Beijing have frayed, administration officials have been airing these grievances privately for weeks. But Mr. Pence’s remarks, scheduled for 11 a.m. at the Hudson Institute in Washington, will be the first time a top American official has strung them together in a narrative of Chinese aggression, and delivered them so publicly. The White House has used Mr. Pence in this role before, notably when he attended the Winter Olympic Games in Pyeongchang, South Korea, and delivered a harsh message to North Korea. Weeks later, the North Korean leader, Kim Jong-un, and Mr. Trump were in talks to meet. Mr. Pence’s speech comes as tensions over the trade war appear to be spilling into other realms. Defense Secretary Jim Mattis recently canceled a trip to Beijing after the Chinese government said high-ranking military officials would not be available to meet him. The speech on Thursday is likely to roil the waters further. Mr. Pence even plans to tackle the politically charged issue of China and Taiwan. He is expected to note that the Chinese government recently persuaded three Latin American countries to break diplomatic ties with Taiwan and recognize the People’s Republic of China — something the United States did in 1979 as part of its diplomatic opening to Beijing. “While our administration will continue to respect our ‘One China’ policy, as reflected in the three joint communiqués and the Taiwan Relations Act, let me also say that Taiwan’s embrace of democracy shows a better path for all the Chinese people,” Mr. Pence is scheduled to say. After his election, Mr. Trump rattled China when he spoke on the phone with Taiwan’s president and suggested that the United States might no longer abide by the One China principle. He backed off under intense pressure from Beijing. Mr. Pence is set to say that the administration drew its conclusions about China’s behavior from intelligence reports, as well as from publicly available reporting. But there is no hard evidence of Chinese election meddling — at least in the excerpts provided on Wednesday evening — beyond what Mr. Trump cited last week in New York. As Mr. Trump did, Mr. Pence will cite a multipage insert that the Chinese recently placed in The Des Moines Register. The insert, aimed at American farmers, highlights the damage caused by Mr. Trump’s trade war. Such public relations campaigns are not unusual for countries engaged in trade disputes. The White House has not claimed that China is using the techniques that Russia used in the 2016 election, like the manipulation of social media or the hacking of email accounts. The vice president will cite a Chinese government document, called “Propaganda and Censorship Notice,” which he will say lays out the goals of Beijing’s influence campaign. “It states that China must ‘strike accurately and carefully, splitting apart different domestic groups’ in the United States,” Mr. Pence is to say, quoting from the document.